Here comes unconventional. The Jeep Cherokee KL caused quite a stir when it was unveiled at the 2013 New York Auto Show, and the effect is no less today at the new Jeep Glenmarie showroom, when it officially enters the Malaysian scene. It’s available here in two trim levels, the Longitude and Trailhawk. The road-biased former gets chrome trim on the grille, lower air intake surround and side window frames, as well as bright silver roof rails. The polished aluminium wheels measure 18 inches in diameter. The more rugged Trailhawk has different front and rear bumpers – with red tow hooks – that improve approach and departure angles. Dark neutral grey exterior accents replace the chrome bits on the Longitude, and the finish also appears on the wing mirrors and the rear skid plate appliqué, while the window frames are black. The 17-inch wheels are smaller on the Trailhawk, but are fitted with beefier tyres. Length, width, height and wheelbase are 4,624 mm, 1,859 mm, 1,681 mm and 2,700 mm respectively on the Longitude. The Trailhawk is 51 mm taller at 1,732 mm (including a one-inch taller ride height from the off-road suspension), has a 19 mm longer wheelbase at 2,719 mm, and is 45 mm wider at 1,904 mm due to wider wheel arch extensions. Standard on both models are self-levelling bi-xenon headlamps, LED daytime running lamps and fog lamps. The Longitude also receives front cornering lamps, while the Trailhawk is the only one that gets deep-tint sunscreen glass, skid plates and a full-sized spare wheel. The power tailgate opens to reveal 506 litres of boot space; fold the 60:40-split back seats and you get 1,500 litres. Inside, you’ll find an 8.4-inch Uconnect touchscreen system with navigation, MP3 and USB, keyless entry and start, auto dual-zone air-con, auto lights and wipers, plus Selec-Terrain with four traction control settings. Choosing the Trailhawk also nets you leather upholstery with red accent stitching, Selec-Speed Control (basically hill descent control) and an additional Rock mode for Selec-Terrain. Through the leather-wrapped steering wheel, which is tilt- and telescopically-adjustable, you’ll see a 3.5-inch TFT screen, or a seven-inch colour unit on the Trailhawk. Above your head is a dual-pane sunroof, and the driver’s seat is eight-way power-adjustable, with four-way lumbar adjustment. Our Cherokees are powered by a 2.4 litre Tigershark MultiAir 2 four-cylinder engine that develops 174 hp at 6,400 rpm and 229 Nm of torque at 3,900 rpm. Transmission is a nine-speed auto. The Longtitude comes with Jeep Active Drive I permanent 4WD, while the Trailhawk adds Active Drive Lock with rear-axle disconnect – the system automatically switches between two- and four-wheel drive depending on conditions. Suspension is handled by MacPherson struts up front and multi-links out back, and there’s electric power steering. Safety kit comprises seven airbags (including driver’s knee), ESC, Hill Start Assist and Trailer Sway Control. The engine can even be started remotely. The Cherokee is available in no less than 10 exterior colour choices, the palette ranging from Brilliant Black Crystal Pearl and True Blue Pearl to Bright White. Fully-imported (CBU) from the US, the Jeep Cherokee Longitude goes for RM348,889, while the Trailhawk is priced at RM378,889, OTR without insurance. A five-year/150,000 km warranty is included. See full specifications on CarBase.my. Uhm I also have the same thought when I first saw the center aircon vents. LoL. But Iriz looks better, this one lacks the Iriz’s chrome & ash grey garnish. Interior fit and finish looks good, despite the design is a little bit outdated and too conventional. Too bad, as the exterior looks fierce and radical. If I have RM350k to spend, I might as well buy a BMW X3. Looks better all around, great driving dynamics and better badge image! probably a Q3 or an Evoque as well! I know Jeep well and I know they are selling much cheaper compared to Land Rovers and BMWs in other countries. The prices in Msia are a bloody rip off! I think it’s roti canai!! 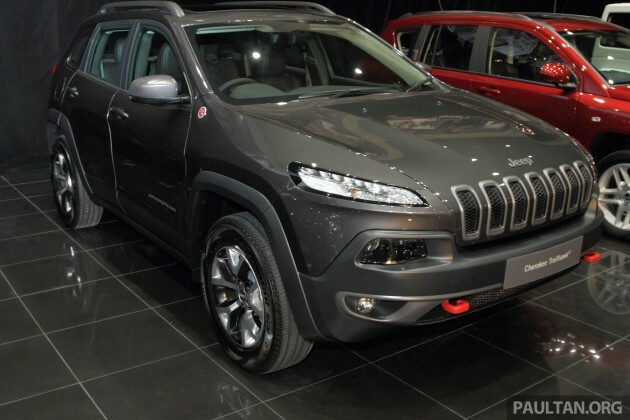 This is a bread and butter car for Jeep in other country, I don’t understand Jeep Malaysia’s marketing strategy is based on what, to be the most expensive and most rip-off model or to hit zero sales target? what a unique design! simply the one of the best looking SUV at the moment! Errr 174hp at RM349k? Thats RM2k per hp ! in the US, its only USD 30,000 with the same specs. Well done to freaking huge margins! Finally now we are talking. The Cherokee, is not a bad car. Ok maybe the squinty face is a bit…. squinty. But besides that, the interior is not bad. Safety is pretty good and it can cope very well, almost like a Freelander. However, Jeep, really, the pricing? That is a bit steep. I’m curious to see the performance though, a 2.4 may be a bit underpowered considering the competition (Freelander, X3, Q5) all have a 2.0 turbo engine with 120Nm more torque at a much lower price point. one jeep cherokee can buy almost 2 santa fe diesel..which also comes with more powerful diesel engine. so i salute those with the ego and money to buy one of these cars. This car costs less than a BMW X1 in DownUnder. I’m sorry to say I don’t think this brand will make much of a success this time around. Too early to judge. Suzuki jimny, 1.3 litre only cost RM90K also people buy where they can buy much comfortable 4X4 trucks. & mostly use on road only. U can’t compare the elasticity of demand for an Rm90k vehicle with a car that is Rm350k. How many would want to buy an overpriced RM350k vehicle when there are so many other better choices at that level? Looks department definitely on par with the Lexus NX. but Jeep isn’t actually categorised as a Luxury brand or vehicle. So for the price, it definitely doesn’t justify why its priced at the same level as the NX, Q5 or to X3.. Interior wise, it has no level of luxury compared to the rest. Engine wise, its weak and Technology wise, its basically just the most standard feature with nothing like Collision prevention/ Blind Spot Monitor/ Adaptive Cruise Control, etc…. But yeah, still a nice alternative to see on the roads. This car and the NX will make our streets look cool.. This officially is the most ripped off car in Malaysia. Seriously, 349k? They must be planning on 0 sales. I guess they will disappear from Malaysia again soon. 174bhp and 229Nmis not worthy of such a pricetag. Who would buy this over and X3? It has neither the brand image nor the performance nor the interior comfort to beat the Germans. Not a bad car. But wrong pricing. In my opinion, this car should be in the RM200k category. By the way, I would like to award this brand with the most ridiculous pricing in Malaysia of 2014! wah 9 speed, meaning 9 time speeder to have my gearbox change? Dear DRB, I think you need to reconsider your pricing. bought a cherokee in ’95. Cost 100k then. Even with inflation, 349k is ridiculous. The price should be in the sub 200K category. I have say they are too expensive…the should have to understand since they are making comeback, it’s wise to start over with sub 300k prices…here, people go for Germans with that kind of price.